The Yonaguni Pyramid is located just off shore on the South side of Yonaguni Island. Yonaguni-jima is one of the Yaeyama Islands and the westernmost inhabited island of Japan. It is the last of the islands in the Ryukyu Islands chain, and lies 108 kilometers (67 mi) from the east coast of Taiwan, between the East China Sea and the Pacific Ocean. The island has an area of 28.88 km2 (11.15 sq mi), a population around 1700, an annual mean air temperature of 23.9 °C, and annual precipitation of 3000 mm. All islands are under jurisdiction of the town of Yonaguni, Yaeyama Gun, Okinawa and there are three towns: Sonai, Kubura and Higawa. It was incorporated under the control of the Ryukyu royal court in 1610. Cape Irizaki, at the western tip of the island, is the westernmost point of Japan. Taiwan is said to be visible from Irizaki on a clear day. It is interesting that the island is part of the Japanese archipelago and exists more than 640 miles from Kyushu, one of the main islands of Japan, while only 67 miles East of Tiawan. During the last ice age, Yonaguni was part of the Chinese mainland. In the 12th century, it was incorporated to the Ryukyu Kingdom. In the 17th century, it was incorporated into the Japanese Han of Satsuma. By 1879, the island was formally incorporated into Japan. Until the early 20th century, Yonaguni was part of the larger Yaeyama village, which included the neighboring Yaeyama Islands. In 1948, it became an independent village. From 1945 to 1972, it was occupied by the United States and was then returned to Japan to form a part of Okinawa Prefecture. In the 1980s, local divers discovered a striking underwater rock formation off the southernmost point of the island. This so-called Yonaguni Pyramid has staircase-like terraces with flat sides and sharp corners. In 1985, Kihachiro Aratake, a diver from Japan, was diving in the waters off the Southern shore of Yonaguni island and discovered something unusual. Upon inspection, it appeared to be a manmade, terraced structure. Believing he had discovered a sunken city, Aratake announced his discovery, but there was not much interest. Later, in 1996, Professor Masaaki Kimura , a professor at the University of the Ryukyus, began to survey the structure. 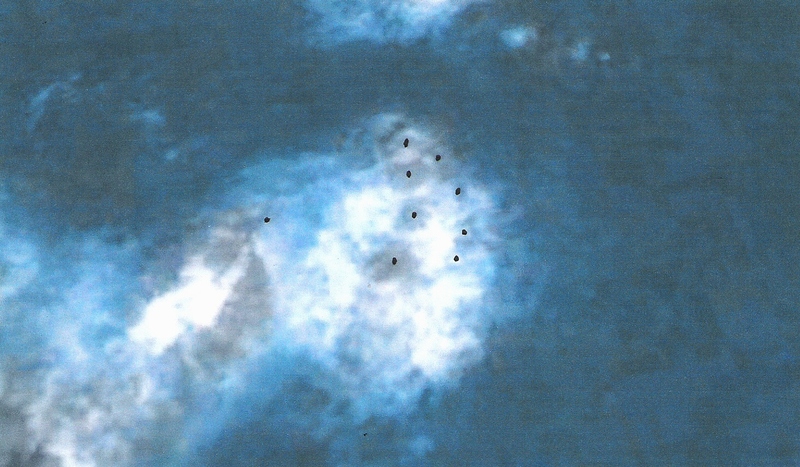 While Kimura maintains that the site is evidence for an advanced prehistoric civilization, others argued that the structure was the result of natural phenomena. Research in the ensuing years has arrived at a consensus that the structure is indeed a man made monolith carved from a natural formation. The formation has since become a relatively popular attraction for divers, in spite of the strong currents. In 1997, Japanese industrialist Yasuo Watanabe sponsored an informal expedition comprising writers John Anthony West and Graham Hancock, photographer Santha Faiia, geologist Dr. Robert Schoch, a few sport divers and instructors, and a shooting crew for British Channel 4 and Discovery Channel. Another notable visitor was free diver Jacques Mayol, who wrote a book on his dives at Yonaguni. A plaque in his honor was fixed to the undersea formations after his suicide in 2001. The Monument consists of medium to very fine sandstones and mudstones deposited about 20 million years ago. Most of the significant Yonaguni formations seem to be carved from one underlying rock mass. The flat parallel faces, sharp edges, the right and precise obtuse angles of the formation would indicate that the monolith was carved by man. 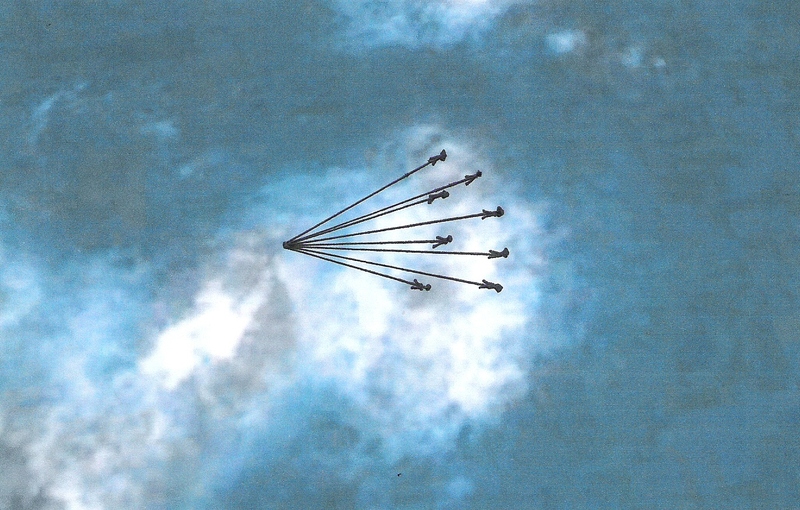 Other evidence, presented by those who consider the formation to be manmade, include two round holes on the edge of the Triangle Pool feature. There also exists a straight row of smaller holes which have been interpreted as an abandoned attempt to split off a section of the rock by means of wedges, as in ancient quarries. Kimura believes that he has identified traces of drawings of animals and people engraved on the rocks, including a horse-like sign that he believes resembles a character from the Kaida script. 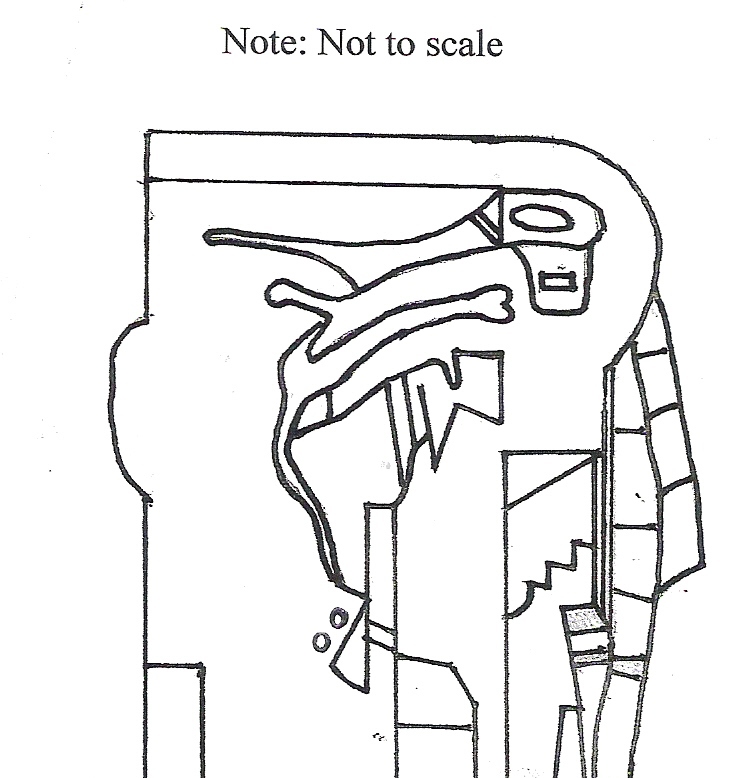 Some have also interpreted a formation on the side of one of the monuments as a crude Moai-like "face". Supporters of man made origin also argue that, while many of the features seen at Yonaguni are also seen in natural sandstone formations throughout the world, the concentration of so many peculiar formations in such a small area is highly unlikely. They also point to the relative absence of loose blocks on the flat areas of the formation, which would be expected if they were formed solely by natural erosion and fracturing. If any part of the Monument was deliberately constructed or modified it must have happened during the last Ice Age (c10,000 BC) when the sea level was much lower than it is today. During the Ice Age, the East China Sea was a narrow bay opening to the ocean at today's Tokara Gap. The Sea of Japan was an inland sea and there was no Yellow Sea. People and animals could walk into the Ryukyu peninsula from the continent. Therefore, Yonaguni was the southern end of a land bridge that connected it to Taiwan, Ryukyu, Japan and Asia. This fact is underscored by a rock pillar in a now-submerged cave that has been interpreted as a fused stalactite-stalagmite pair, which could only have been formed above water. The existence of an ancient stoneworking tradition at Yonaguni and other Ryukyu islands is demonstrated by some old tombs and several stone vessels of uncertain age. The Yonaguni Monument is important in Graham Hancock's documentary "Quest for the Lost Civilization". The monument was featured on episodes of Ancient Aliens and History's Mysteries, both on The History Channel. In an interview, Prof. Kimura was asked whether the ruins were artificial, and in what time period they were built. "These are ruins, and to me, the fact has already been proved. The scientific conclusion is that the ruins are indeed artificial (Manmade). 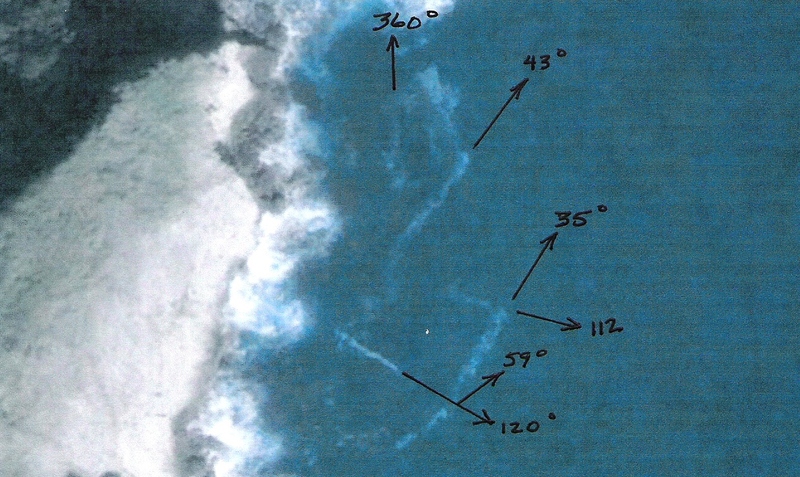 A school of Japanese marine geologists agreed on this outcome. We found that the ruins are at least 6000 years old. It could go back another 4000 years when we consider the length of time before they sank into the water. " "During the past 10,000 years, the ocean water level rose about 40 meters. From this fact, it is only natural to think that many ancient civilization are now deep under water. Drills we use to investigate ruins have improved recently, so with the help of the latest equipment, we may have a scientific conclusion on this matter in the near future." Professor Kimura states that even though there is scientific evidence to explain the ruins, it might be difficult to come to an agreement with the archaeologists, as doing so changes history. The information gathered for presentation on this website was gathered using the new science of Geoglyphology. (Google keyword: Geoglyphology). The calculations performed on this website require the use of a special software called "Google Earth". Google's software is able to calculate true spherical bearings on a curved surface and then display them correctly on a flat plane. This software can be acquired free by searching the internet using the keywords "Google Earth". In spherical geometry all lines are curved along the surface and no lines are parallel. It is difficult to grasp the concept that two parallel headings can cross. That is because we are used to thinking in terms of Plane Geometry on a flat plane. However, this changes when you draw lines on a sphere. In dealing with a sphere you enter the realm of Spherical Geometry. Spherical Geometry is the study of figures on the surface of a sphere, as opposed to the type of geometry studied in plane geometry or solid geometry. In spherical geometry, straight lines are great circles, so any two lines will meet in two places. There are also no parallel lines. The angle between two lines in spherical geometry is the angle between the planes of the corresponding great circles, and a spherical triangle is defined by its three angles. There is no concept of similar triangles in plane geometry. In the field of Geoglyphology, we are plotting lines in a spherical world and then displaying the results on a flat plane. That is why the field of Geoglyphology could not have been proposed without the advent of software that computes using Spherical Geometry while then displaying it on a flat plane. 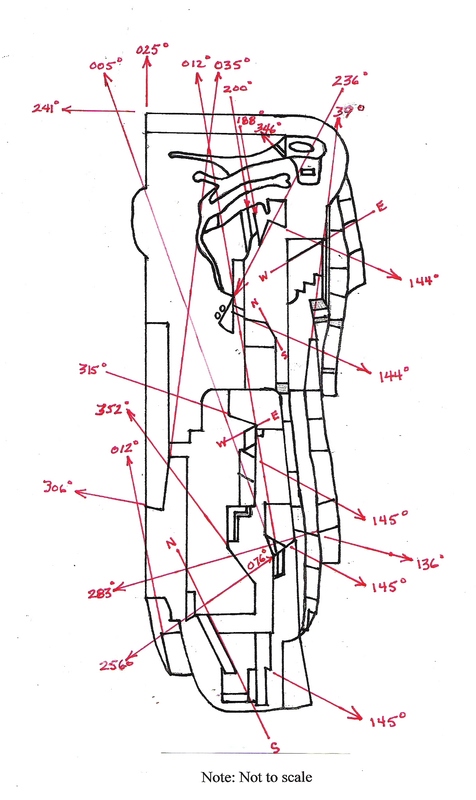 This type of precise mapping precludes the plotting of these bearings on a flat map. Maps become distorted when converted from a sphere to a flat map. 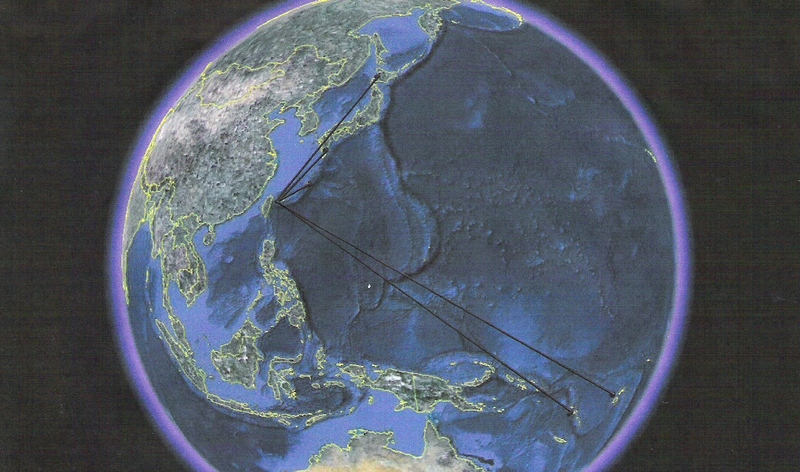 Any lines that are depicted on a flat non-satellite map, on this website, were first plotted using the Google software and then drawn on the flat map after the end points were determined. Even then, the proper curvature is missing. Glyph - A glyph can be any design that is used to convey a message. Geoglyph - A geoglyph is a glyph that occurs on the ground. Bearing - A bearing refers to the direction, as determined from a magnetic compass, that any line formed by a geoglyph points in relation to "True North". True North is used because as soon as you begin tracing a magnetic line away from the source, magnetic deviation becomes a factor. Magnetic Deviation exists all over the world and renders magnetic headings useless over long distances because of the error it causes in a magnetic bearing. True headings are derived from Celestial Navigation, GPS, and computer software. These methods produce True Headings which are not distorted by Magnetic Deviation. Radials - Radials are bearings, converted to a True Course, after they leave the source. At the source Bearings (Magnetic North) and Radials (True North) are the same because no distortion has taken place by moving away from the source. Once a direction away from the source is plotted it must be plotted on a true course, not a magnetic course, in order to avoid magnetic deviation. Yonaguni Pyramid - View from above. Endpoints for the radials displayed in the above photo. 035 Degree Radial - Southern tip of Kamchatka Peninsula, Russia/Northern tip of the Japanese island string. 076 Degree Radial - Hawaiian Islands. 306 Degree Radial - Bitou Point, North tip of Taiwan. Both old and updated geoglyphs. 315 Degree Radial - The Glyphs at Fushancun, China coast. This glyph points to Northwest corner of Korean Peninsula and Fiji. As with so many other geoglyphs around the world the endpoints circumscribe the boundaries of what appears to be a territory or land claim. 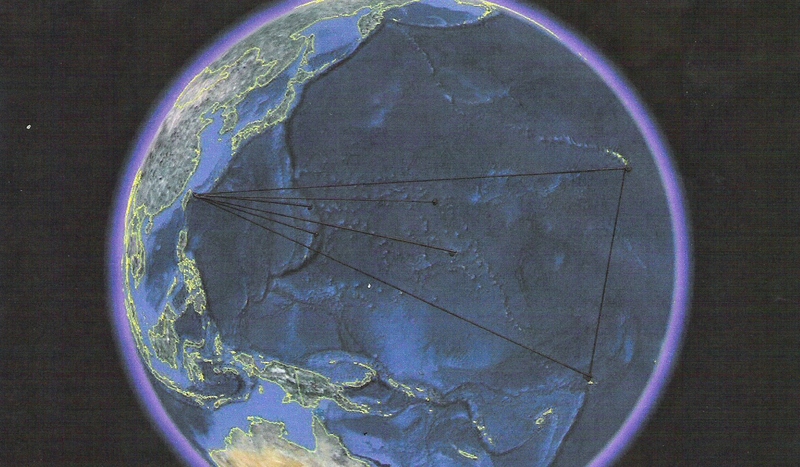 After plotting the boundaries circumscribed by the Yonaguni Geoglyph I noticed that the territory looked very familiar. After some research my hunch was rewarded with the information you see in the following map. It is amazing that the territory outlined by the Yonaguni Geoglyph matches, almost exactly, with the territory Japan was attempting to occupy in the second world war. The Yonaguni Geoglyph mimics many other ancient geoglyphs around the world which described similar territories, many of which are still honored to this day. Most of geoglyphs in this category originated around 8000-10000 BC. Based on initial investigations it would seem that some entity awarded various peoples set boundaries within which they were to grow and prosper. Many other territories are outlined in my recent book "Ancient Signposts' available through Amazon.com. What enforces the belief that these were coordinated territories is that fact the ancient territories seldom overlap. There is another fact that enforces the concept that the Japanese were attempting to reclaim lost territory. The Japanese actually attacked and occupied Attu Island, on the tip of the Aleutian Islands in Alaska, even though it was of no use to them. Many have wondered to this day why that was done. If they were attempting to restore ancient boundaries this would explain that seemingly irrational move. The land was retaken by the U.S. Army in the battle of Attu. While plotting any geoglyph it is our practice to search the destination point for other geoglyphs. There were several found using the Yonaguni radials, however, the most interesting were two geoglyphs, located together, which seem to be a precursor to the Yonaguni Geoglyph. The two appear to have been constructed at different periods in time and seem to have much in common with Yonaguni. These geoglyphs were discovered by following the 241 degree radial from Yonaguni to the coast of Taiwan at a place named Fongbin. 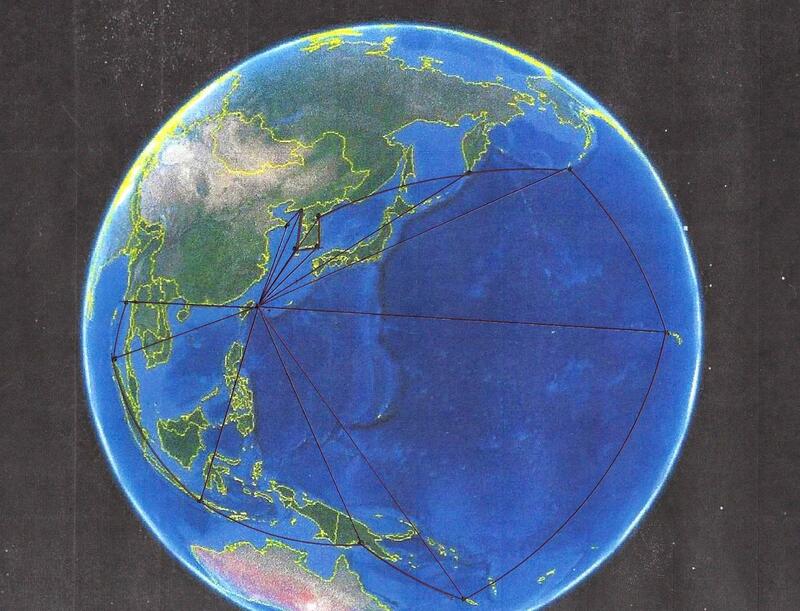 As you can see, from the list of radials emanating from the Yonaguni Pyramid, the 241 radial points to a spot on the East coast of Taiwan, known as Fongbin. 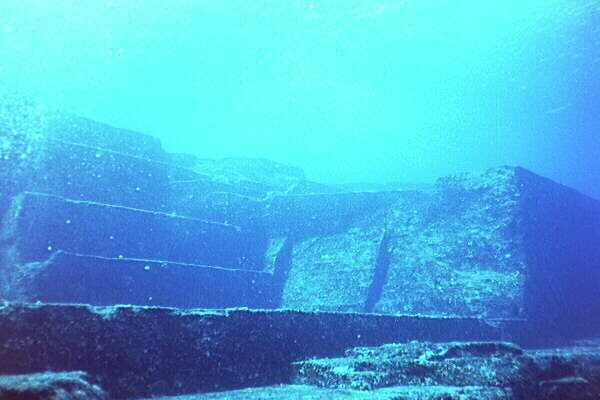 In the photo above you can see that these glyphs, like Yonaguni, are also covered by water. Interestingly enough the Fongbin glyphs appear to circumscribe territories also. From the islands identified by the Fongbin geoglyphs it appears that they may have been built earlier than the Yonaguni glyph and therefore describe smaller territories. It is possible that the second Fongbin glyph was made to claim islands discovered after the first geoglyph was laid down. Based on our research the type of geoglyphs used in glyph #1 above are from an earlier period than the ones used in Glyph#2 which appears next. The above glyph consists of what is called a glyph array. It consists of a center point surrounded by points through which bearings can be calculated by drawing a line from the centerpoint through the surrounding points. The discovery of the Fongbin geoglyphs, along with the Yonaguni Geoglyph, appears to indicate additional exploration and expanding territorial boundaries, over time, culminating in the larger territory defined by the Yonaguni Geoglyph. The hypothesis that the Fongbin and Yonaguni geoglyphs show a progressive expansion toward the Americas is supported by recent finds in the Western and Central Americas. An archaeological team, consisting of the Universities of Texas A&M, The University of Illinois and The University of Minnesota, announced in Science Magazine, in March 2011, that they had identified the oldest human archaeological site in North America at Buttermilk Creek, South of Kileen Texas. The site is confirmed as having been inhabited as far back as 15,500 years ago (c.13,500 BC). To date, the oldest human remains, in North America, have been found on The Channel Islands in California and date back 14,000 years. (c.12,000 BC). This coincides nicely with the dating of the Yonaguni Geoglyph which has been tentatively dated to c.10,000 - 12,000 BC. Michael Waters, a team leader and director of the Texas A&M Center for the Study of the First Americans, states that; "If you look at the genetic evidence, the native people in North America came from Northeast Asia, then crossed over into the New World. Waters also states; "The corridor between the two ice sheets (Asia and North America) was closed 15,000 years ago. The only option to them is to come by boat in this kind of secondary way, along a coastal route to get into North America." This also coincides with the idea that the fact that the Asian people of Yonaguni were sea people, and that the oldest North and South American habitations are being found on the West Coasts of those continents. Waters goes on to say; "Sea levels were lower 15,000 years ago, so any evidence (of the migration) would likely be buried under the ocean floor." This statement also coincides with the fact that both the Fongbin and Yonaguni geoglyphs are under water. Click here to visit a plausable explaination of the artwork displayed above. 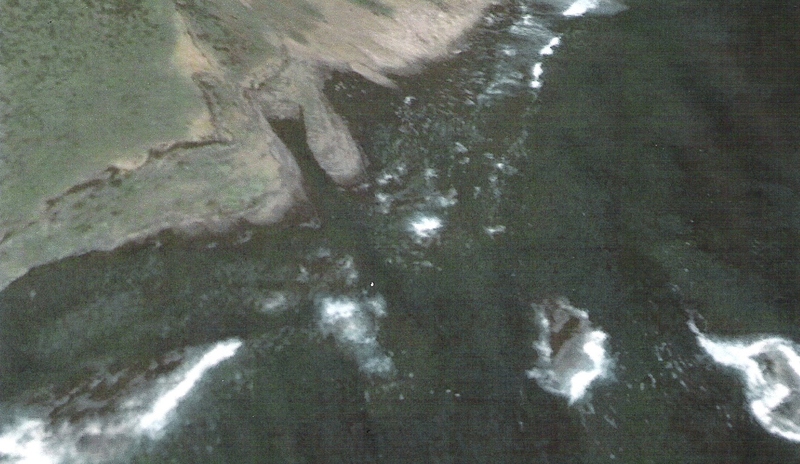 The above photo shows a notch carved out of the hill right above the Yonaguni Structure. Could this have been a stairway leading down to the ceremonial location, or a harbor for a boat that would ferry people to the monument? Obviously this raises many interesting questions, not the least of which is; How did a 10,000 year old civilization know so much about the human reproductive process and what was the purpose of the ceremony. 1. None of the ancient geoglyphs show signs of human habitation. In other words, there were no signs of burials, tools or animal bones. This is the case when the site is a ceremonial site and the users of the site live elsewhere. 2. At or near the sites there appears an altar or circular enclosure that could have been used for a ceremony. 3. Many of the altars, or enclosures, appear to have been placed to provide vantage points, and seating, from which others could view the ceremony. 4. Many of the ancient sites are constructed in a manner which form geoglyphs that appear to outline the boundaries of what may have been an assigned, discovered, or conquered, territory. 5. Of the geoglyphs studied thus far the territorial boundaries do not appear to overlap. Could this be an extremely advanced ancient human culture attempting to repopulate the world after the ice age? The gradual expansion of the territory represented by the Fongbin and Yonaguni geoglyphs suggest that the monoliths were built over time. One has to ask how they knew the geography of the earth so well, and how they were able to plot courses halfway around the world with the precision of a GPS? A possible answer may be explained by the worldwide, pre-historical, obsession with astrology. It is now known that man has been traveling the globe for millennia. It would be self-serving to think that over tens of thousands of years man could not have gained the astrological ability, and geographic information, to map the world with such precision that they could not plot courses and bearings as well as our current GPS systems. Of course, there are years of scientific study, in many scientific fields, that this information opens up. It is not the intention of the Faram Foundation to circumvent any established scientific protocols, but to offer food for thought and discussion in an expeditious manner outside the normal, and often tedious, academic arena. All our work is copyrighted. However, anyone is free to develop our ideas past the stages that are offered in our articles in hope that some type of recognition will be given to the originators of the information. Even the information that we offer on our websites is available for broadcast in the media provided proper recognition is given as to where the information originated. Videos of monolithic items on the island itself. 01. Masaaki Kimura (1991) . "The Continent of Mu was in Ryukyu". Tokuma Shoten. 02. Ancient Discoveries: "Lost Cities of the Deep History Channel"
03. Skematic drawing of the Monument at the Ishigaki, Okinawa city site". http://www.city.ishigaki.okinawa.jp/en/engnews/ishigakitimes/yonaguni.jpg. Retrieved 2010-07-06. 04. 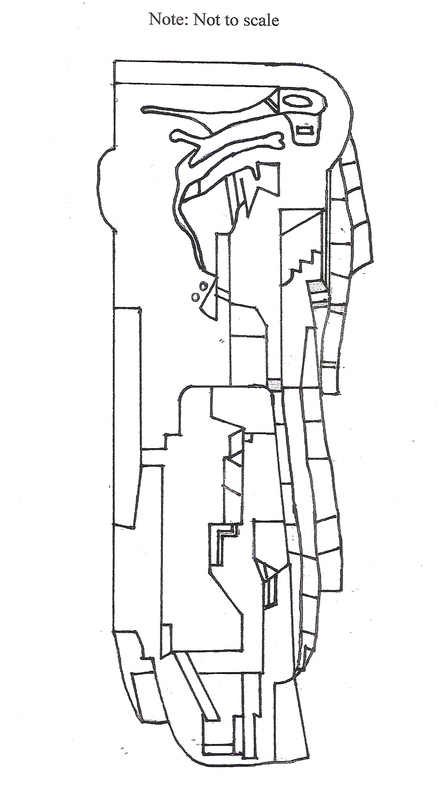 Schematic maps of the Monument at the Alternative Archaeology site". 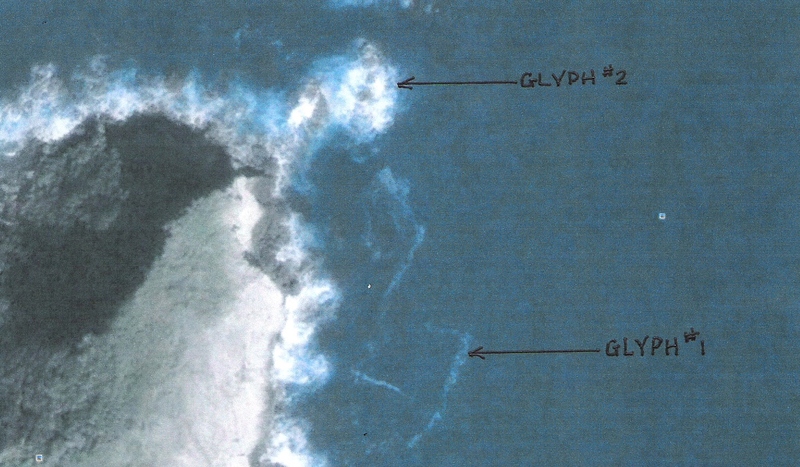 http://www.altarcheologie.nl/index.html?underwater_ruins/yonaguni/overview.htm. Retrieved 2010-07-06. 05. Doremon360. "3D model of the Monument". http://farm2.static.flickr.com/1007/575738157_c0a242bbd5.jpg?v=0. Retrieved 2010-07-06. 07. Yonaguni, Japan". New Scientist (2736). 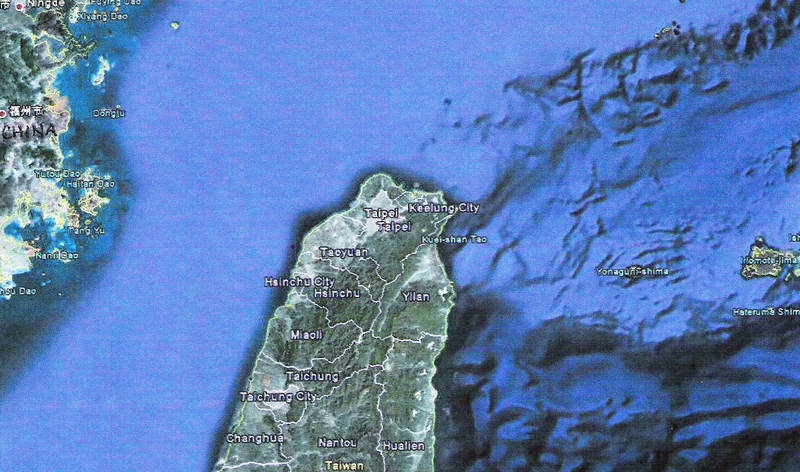 2009-11-25. http://www.newscientist.com/article/mg20427361.500-yonaguni-japan.html. Retrieved 2010-07-06. 08. Julian Ryall (2007-09-19). "Japan's Ancient Underwater "Pyramid" Mystifies Scholars". http://news.nationalgeographic.com/news/2007/09/070919-sunken-city.html. 09. National Geographic News Photo Gallery: "Asian Atlantis" Shows Strange Structure". http://news.nationalgeographic.com/news/2007/09/photogalleries/japan-pictures/. 11. Barot, Trushar, 1998. "Divers find world's oldest building." The Sunday Times [London], 26 April 1998, page 4. 12. Hancock, Graham, and Santha Faiia, 1998, "Heaven's Mirror: Quest for the Lost Civilization." London: Michael Joseph. 13. Joseph, Frank, 1997, "Underwater City found near Japan," Ancient American, vol. 3, #17 (March/April 1997), pp. 2-6. 15. Schoch, Robert M., with Robert Aquinas McNally, 1999, "Voices of the Rocks: A Scientist Looks at Catastrophes and Ancient Civilizations". New York: Harmony, Crown Publishing Group, Random House.